Re: Woohoo, I made it to the springs!! Rick, Perhaps I under stated my self. I love the spring water. I usually get mine from the spring up the hill next to the trail. My thermometer always says it is 126-128 degrees. It depends on if the sun is shining. At least 1/2 a gallon, somtimes more. Sometimes I will share w/friends who love the springs. To me the best time to drink it is in the middle of the night after dreaming of being at the springs, chilly cold. Gee can you tell I`m still studying the I.R.S. tax code. If you will get out your Delorme map. 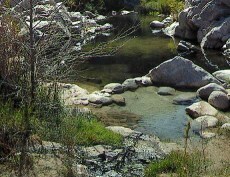 You may notice, that the hot springs is almost but not exactly due north of where the Arrowhead springs water is harvested. And on the oppisite side of the same mts. Aint life amazing? OHH! I see I mentioned a subject close to your heart Rick, photography. Woohoo, I made it to the springs! !